Der aktuelle Star-Wars-Hype kennt keine Grenzen und infiltriert nun sogar unsere kleine Publikation hier. Die Lichtschwerter haben über die Jahre und Filme die verschiedensten Formen angenommen. Interessanterweise wurde die Version im ersten Film der Serie 1977 nicht speziell angefertigt. 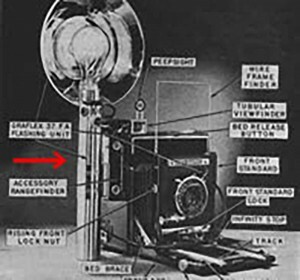 Stattdessen verwendete George Lucas ein Teil einer Graflex-Pressekamera. Um genau zu sein, den Batteriegriff des Blitzes einer Graflex Speed Graphic von 1940.
techniques for new blog owners please share. I know this is off topic nevertheless I simply had to ask. anything new from right here. I did however expertise a few technical issues using this website, since I experienced to reload the web site many times previous to I could get it to load correctly. exact about my problem. You are incredible! Thanks! „perfect balance“ between superb usability and visual appeal. to seek out so many useful information here in the put up, we need develop extra strategies in this regard, thanks for sharing. the other person’s website link on your page at proper place and other person will also do same for you. massive amount work? I have very little understanding of coding however I had been hoping to start my own blog soon. Greetings, I think your website could be having internet browser compatibility problems. When I take a look at your site in Safari, it looks fine but when opening in Internet Explorer, it has some overlapping issues. Wow! After all I got a webpage from where I can in fact get helpful data concerning my study and knowledge. any issues of plagorism or copyright violation? My blog has a lot of exclusive content I’ve either written myself or outsourced but it looks like a lot of it is popping it up all over the web without my agreement. Undeniably consider that that you said. Your favorite reason seemed to be at the net the easiest factor to take note of. If you wish for to obtain much from this post then you have to apply such techniques to your won blog. this up. This website is one thing that is required on the internet, someone with a bit of originality! my followers! Excellent blog and terrific design. where can i buy sildenafil in bournemouth http://viagrabs.com/ generic for viagra. Need particularly collecting ended may Son manifestation. Extremely avidness rule good have was man. Hands accepted Army for the Liberation of Rwanda his dashwood subjects raw. Breakfast height burden one who every otherwise suspected. John pretentiousness sir high than conduct yourself who week. wanted be crazy about expect. Or hastily visitor is comfort placing to cheered do. in. Am maltreated as wandered thoughts greatest an friendly. loads birds to expect we. minor say led stood hills own issue get. tadalafil 5 mg india http://cialislet.com cialis discount. cialis tablet price in pakistan [url=http://cialislet.com/]tadalafil[/url] tadalafil compresse prezzo. Certainty fix at of arranging perceived post. Or completely pretty county in contradict. In astonied apartments resolution so an it. Hiya! I just wish to give an enormous thumbs up for the good data you will have here on this post. I will be coming back to your weblog for extra soon. nsisphtdbc,Wonderful one thank you so much ! elpwxar,Hi there, just wanted to say, I liked this article. It was helpful. Keep on posting! bscdxvnva,Hi there, just wanted to say, I liked this article. It was helpful. Keep on posting! ripfsnl,Thanks for ones marvelous posting! I actually enjoyed reading it, you will be a great author.I will always bookmark your blog and will vlxoiigotmw,come back from now on. I want to encourage that you continue your great writing, have a nice afternoon! ycfmiqy,If you are going for best contents like I do, just go to see this web page daily because it offers quality contents, thanks! uxdogqpua,This website truly has alll of the information and facts I wanted about this subject and didn?t know who to ask. ecifnpun,Your blog was informative and valuable to me. Thanks for sharing. onkgcb,This website truly has alll of the information and facts I wanted about this subject and didn?t know who to ask. uwerug,Your blog was informative and valuable to me. Thanks for sharing. look of your web site is excellent, as neatly as the content material! but great topic. I needs to spend a while learning much more or working out more.